If you are looking for inspiration for your gardening project then look no further. Andy Sturgeon's blog has it all. Draw inspiration from posts about Andy's show garden at the 2016 Chelsea Flower Show, and a visionary post about his recently commissioned landscape project in Kent. Andy has a knack at drawing out the essence of a place using innovative planting and garden design. 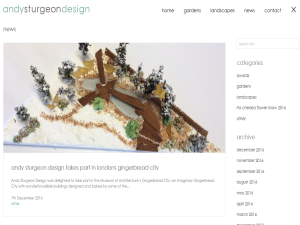 This what your Andy Sturgeon Landscape and Garden Design Blog Blog Ad will look like to visitors! Of course you will want to use keywords and ad targeting to get the most out of your ad campaign! So purchase an ad space today before there all gone! If you are the owner of Andy Sturgeon Landscape and Garden Design Blog, or someone who enjoys this blog why not upgrade it to a Featured Listing or Permanent Listing?